I was a little anxious about travelling alone to Bogota because of all the press about drug crimes. I bought a new secure backpack and had it wrapped in plastic at the airport so that it would be difficult to make me a ‘drug mule’. The people sitting next to me didn’t seem to speak much English and the Lan Airlines flight entertainment wasn’t working so it was just as well that I had a lot of preparation to do on the sixteen hour flight to Santiago. I arrived around lunch time and the next plane to Bogota left at 9.30 in the morning, so I sampled a South American style airport hotel which, unfortunately, is not very different from an Australian one. There was a shuttle bus to the hotel, but no clear way of getting from there into the Santiago city centre, which was some distance away. So I prudently remained close to the airport and forced myself to stay awake until South American bedtime by having lunch (assisted by my Latin American phrase book) and wandering around the hotel swimming pool area, which was not very extensive. 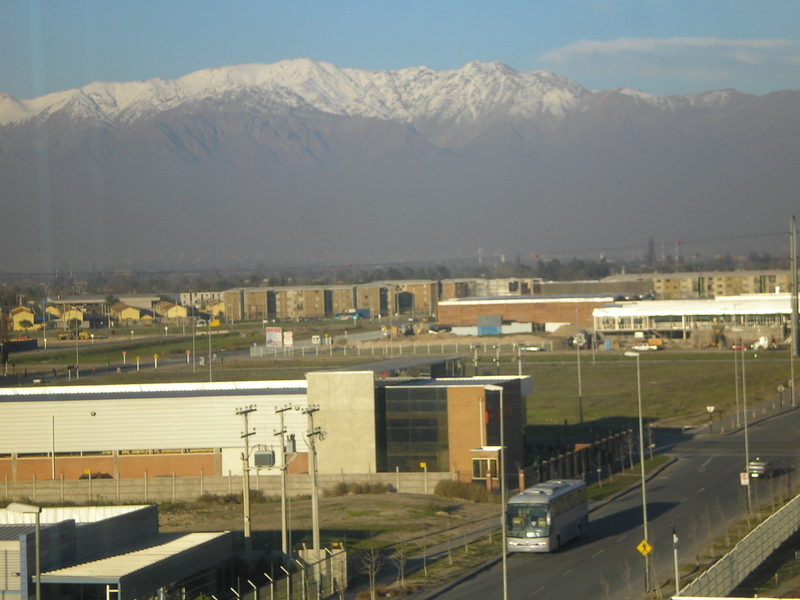 I was reassured that I was actually in Chile when I looked out to the snow-capped craggy mountains, which I assumed were a part of the Andes. Next morning I set off for ‘Eldorado’ – the name of Bogota international airport. (It reminds me that in Adelaide you can catch a bus to ‘Paradise’.) The plane was going on to Miami and there was a small part of me tempted to remain on board rather than face up to the challenges of finding my way around downtown Bogota and the work I had to do. Hotel Bacata would send transport to the airport – that was all I knew. And I ultimately recognised it – a taxi driver holding up the name: ‘Jenifa Brais’. We set off down Avenue Eldorado, detained by a student demonstration and the need to buy petrol. The hotel did its best to accommodate me comfortably. It was the kind of hotel that catered for local sports teams rather than international visitors with no Spanish. When travelling for work I usually make use of the hotel gym. Hotel Bacata had a gym that opened at 6.00 am. I fronted up at 6.30 am. There was no one around. I could not get any of the machines to work – they weren’t turned on, yet there seemed nowhere to turn them on. I looked fruitlessly behind curtains and partitions for a master switch. There was a phone and a sign (in Spanish of course) – and I knew it said: for service please call this number. But I also knew that I would not be able to make myself understood, so I gave up, somewhat deflated by the defeat. For breakfast there was a choice of lumps of meat floating in watery soup, or watery scrambled eggs. I went for the scrambled eggs.